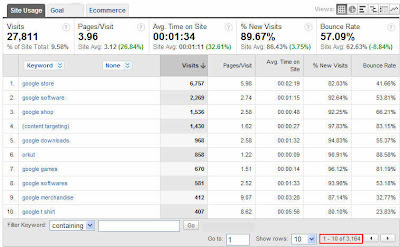 As more and more people use Google Analytics to run reports for their advertising campaigns, we've had to come up with faster and easier ways for people to use Analytics for their everyday needs. One request that comes up quite often is to do away with 500 row export limitation for reports. Understandably, it's annoying to repeat your steps when you're exporting a report that has more than 500 rows. We've found a helpful workaround that lets you export any number of rows in one go. We've listed the steps below so that you can bookmark this page whenever you need to export all the data listed in your reports. In our example Keyword report, you can see that there are over 3,000 keywords to export. This would mean that we'd have to hit 'Export' over six times! 1. Go the report that contains the data you want to export. 2. Append "&limit=5000" (or however rows you need) to the URL displayed in your browser URL window, and hit enter to reload the report. 3. After you've clicked 'Enter,' visually confirm that the URL displayed in your browser has the "limit" parameter appended to it. While there won't be any visible difference in the user interface, exporting will now yield more rows. 4. 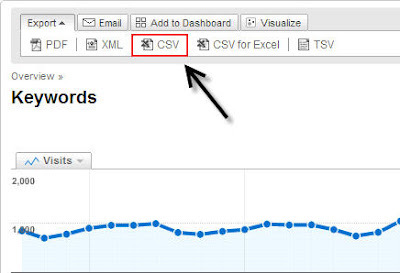 Select the Export tab, and click 'CSV' (not the option that says 'CSV for Excel'). 5. The exported data should contain all the rows from your Analytics table. We hope this added some precious time back to your Monday!